Thank you Dr. Pandya for your help and advice. My knee is much better now - so much so that I have been able to complete a number of trail races throughout the Edmonton river valley system, without any problem. I will be sure to return if I my problem recurs or any other issue crops up. I have had treatment at Eastgate Physio for two different problems. Once for my ankle and recently for my shoulder. Both were resolved under the expert treatment of Satish. He is very encouraging, experienced and knowledgeable. His staff are also very helpful. I highly recommend him. I definetly would recommend Satish to anyone! From my first appointment he was super friendly and helped me out immensely. My knee injury and recovering is a long daunting road, but I am always in a positive mindset after leaving my appointments! Michelle is a wonderful person as well and is always there to help out with any questions I may have. Huge thank you to Eastgate Physio!! My right knee developed swelling around it over the Christmas holidays and I could not weight-bear at all. I had a Baker's cyst drained and received physio for pes anserine bursitis. Satish was very knowledgeable, helpful and gracious and I am now walking pain-free. Thank you so much! Having never been to a physio therapist before I was nervous and a bit sceptical. But within minutes of being in the office and talking with the friendly, knowledgeable receptionist Michelle, i was comfortable and relieved of my worry. The professionalism and care of Dr. Pandya, helped me reach my goals and the improvement I felt was immediate. I always feel welcome and am always treated with respect. I would recommend Eastgate Physiotherapy without question. Thank you Dr. Pandya!. All of the staff are friendly and knowledgeable. You get personalized attention for you. Me, my daughter and wife have all been to this office over the years for various issues and all have been resolved. Satish knows his stuff and does a very thorough and detailed evaluation. Know that if you commit to your part in the rehab process, Satish will set you on the right path to recovery. Note that the massage therapist there was excellent as well and I highly recommend her. After hurting my wrist, I came to Eastgate Physio hoping to get some pain relief. Satish came in and quickly pinpointed the issue. After just a few sessions I began to notice a difference. He is very professional and knowledgeable and I know I am in great hands! The entire staff at Eastgate Physio are wonderful, very accommodating and polite. I'm looking forward to the rest of my appointments! I first met Satish back in 2004 when I was suffering with plantar fasciitis. His simple, effective hands on approach had me up and moving again very quickly. Over the years I have had other injuries and I have trusted and been very pleased with Satish' extensive knowledge, professionalism and care. I wouldn't consider going to anyone else for my physiotherapy needs. When I first came to Eastgate physiotherapy in June 2016 I was on crutches and wearing an air cast. This was the result of missing a step and then in the process of the fall landing with the top of my foot on said step causing 2 breaks as well as small piece on the top to detach. Mid July I slipped again dislocating a toe and re-injuring my nearly healed foot. In addition to my foot issues I also missed a few appointments due to severe migraine headaches. Satish spoke to me about finding relief through Acupuncture, being petrified of needles I was not too keen on this idea, that is, until during a physio appointment I was once again disabled by a migraine blinded by the lights and unable to function. Satish once again brought up Acupuncture and I reluctantly agreed. He was respectful of my fears and talked me through the procedure making sure I was fully functional before letting me go for the day. It is now mid November I am pain free and finally able to bend all my toes and headaches have been minimized! I feel so much better that I actually expressed to Satish that he has been like a God. On a snowy wet lunch hour in December 1989, I was in a car accident. This left me with a hard to diagnose wrist injury. I started physiotherapy with Satish Pandya, at Eastgate Physiotherapy. My wrist was permanently damaged. For nearly three years I struggled to find a specialist who would diagnose my problem. During that time Satish worked very hard to reduce my pain and swelling. He even called people at the University to help him figure out ways of reducing my pain. After three years I found a surgeon who diagnosed my problem. I had a small bone in my wrist that was broken, and also a bone cyst. This required a wrist surgery that left me with 20% use of that wrist. After my surgery I went back to Satish of course. He continued to work on my wrist as needed. That was off and on, to this very day. My doctor sent me to Satish to work on an ongoing back problem. This too is a permanent injury from a fall on the ice when I was 14 years old. By then Satish had taken and acupuncture course, and I willingly became and guinea-pig. To my astonishment not only did the acupuncture work, but it also took the swelling from my wrist down. My back will probably never be good, but with Satish’s help I can keep active. During this period of time I developed fibro-myalgia. So again Satish helped me live with that. He never seemed surprised at anything I threw at him. He was there when, with my doctor’s consent, I threw out all of my medication for fibro-myalgia. As we worked at getting the correct medication for my condition, Satish worked alongside of us to try to keep my pain levels at a liveable level. I still go to Satish once a week, or every second week. I know that he will listen to what I have to say, and figure out the best treatment to use. He has a kind soul, and would like to cure all the pain that crosses his path. I first met Satish in 1998 when I required assistance in bringing my right knee into its proper range of motion following knee surgery to replace my anterior cruciate ligament. With gentle, yet firm hands Satish led me through positive exercises at his facilities as well as "home work" I was to do on my own. His compassion was always present and his knowledge of what to do for me was exceptional. A full recovery occurred. Years passed, and once again I was in need of Satish's help. This time I had injured my back while clearing out gutters on my house roof. Satish worked in partnership with me and once again a successful recovery occurred. My most recent return to Eastgate Physiotherapy (May 2012) was to have Satish help me through a very painful realignment of my shoulders and wrists due to Rheumatoid Arthritis. Satish again implemented a plan of action that brought me into the rehab process and as we near completion I am forever grateful to Satish for his patience and outstanding methods for dealing with this disease. I highly recommend Eastgate Physiotherapy for any problem you may have, as Satish has outstanding skills and knowledge. When I first came fro acupincture, I could hardly walk the pain in my lower back and down my right leg was so bad. I was in constant pain. I started getting accupuncture and it made the world of difference. I am back doing housework and walking without pain. Thank you so much! Since retiring from the military and having been diagnosed with degenerative disc disease, cervical spondylosis C4 and C5, right and left rotator cuff tear and chronic back pain I started to routinely attend physio sessions with Satish on a weekly basis. Through a combination of stretching exercises and by following a regular pattern of exercises when possible (performed on my own time). I have progressively maintained freedom of movement and motion. Starting almost 2 years ago we started acupuncture therapy which in my opinion has been the key to achieving the success that we currently have reached. Thank you for the care and professionalism that you have provided to me to maintain an active lifestyle and acceptable standard of living. I have been going to Eastgate Physiotherapy on a regular basis since spring of 2006. I have been suffering from chronic pain throughout my whole body for many years now. There were days where life seemed hopeless and not worth living. I was bed ridden on many occasions, and had been collecting disability from being unable to work. I had been tested for anything and everything possible, but I was always told there was nothing wrong. I also tried many forms of treatment and found nothing helped my situation. Pain killers only masked my pain, but never solved the problem. I was very happy to finally discover a treatment known as IMS. This has truly made a difference in my life. With persistence and regular treatments I was soon able to get back to work and start living a normal life again. I am not sure if I will always have to continue my weekly treatments of IMS, but it is worth it. I know that I am in good hands with Satish Pandya. He has incredible knowledge in this area, and is such a compassionate and caring person. He never gives up on challenges such as myself, and is so gentle in doing this treatment. I don’t know where I would be today if it weren’t for IMS treatment, and the knowledge of Satish Pandya. Thank you for everything Eastgate Physiotherapy. have been seeing Satish for many years now. He is an amazing man with incredible hands. First in April 1996 I had hurt my ankle during a bad fall and he had me healed (physiotherapy and home exercise) and I was back up and running within a very short period of time. Then in November 2005 I had lifted a battery out of a car which hurt my back and disabled my left leg for a period of 2 or 3 weeks. Satish's magical hands helped heal my leg muscles (physiotherapy and home exercise again). In January of 2009 I had surgery to repair the bulged disk at L5/S1 and to widen out the nerve canal at L4 and L5. After the surgery the sciatic nerve pain in both legs had gone away but I still had some nerve pain/numbness in my back, left and right legs along with hot feet. Satish first tried acupuncture and then physiotherapy and home exercises with little to no results. Satish did not give up, he suggested IMS treatment and so far the pain, numbness, hot feet has lessened. I will continue on the IMS treatment plain, but it looks like this is the problem, shortened muscles in both my back and left leg that will heal with treatment and time. Also my wife had hurt her knee in October 2010 (turning while lifting one of our grandchildren out of the bathtub) and Satish again used his magic and healed her knee within no time at all. During one of our sessions my wife had lost her voice the day before, Satish was doing acupuncture on her knee and said that I can fix that for you, he added extra acupuncture needles in a few strategic places and we left the office with her talking again, he's just that amazing. This man is unbelievable and we have recommended him too many of our family and friends. P.S Sara has been awesome at taking care of us before, during and after each session, keep it up Sara! My healing experience with Satish extends over many years. Starting with a major car accident in 1997 I began intense therapy and over a period of time, I acquired almost a full recovery. A few years later, another car accident, minor this time, took me back to the healing hands of Satish. Currently, I am in healing for tendinitis in my right hand and I am confident that I will heal once again with the help of Satish. My husband and children have also been through successful therapy with Satish. When in need, we are thankful we can go to Satish. I spent 3 weeks in July with back spasms that at times took my breath away with pain. As long as I stood rigidly straight, and moved slowly, I could get through a busy day. My doctor recommended Physio, and I arranged an appointment the next day. After a review of my situation, Satish recommended treatment with a machine which sent electric shocks into my back at the injured spot. After one 40 minute treatment, the pain was totally gone. Two more follow up treatments the following week were done, and I have had no further problems. Thank you Satish for bringing me another pain free 35 years!!! I got hurt at work doing excessive shoveling and raking. I woke up one morning and my hands were contracted shut and I could not raise my arms. I had severe pain in my wrists and elbows as well as constant numbness and tingling in my fingers. I was sent to Physio in a small community 2 hrs from Edmonton where I was working. They treated me for a full month for tendinitis and carpel-tunnel. I left every day in pain and even after my hands opened back up, I didn't even have the strength to open a bottle of water. 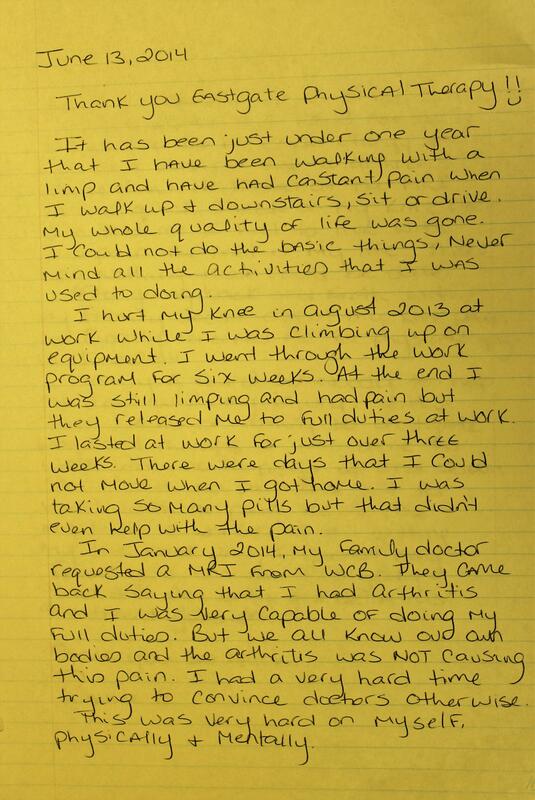 I had given up hope when the specialist told me to continue with physio at a new physiotherapist in Sherwood Park. My 1st apt. with Satish @ Eastgate Physiotherapy he told me "I can fix you". I laughed in disbelief. He used a technique that involved applying specific pressure in my shoulders! Immediately, I could lift my arms! After a month of disappointment in just one session he took an immense amount of pain away! Two doctors and two different physiotherapists and none of them figured it out. I had no idea my shoulders were the root of my pain. My next session I was very tense, as Satish had warned that I might be. When I returned he did acupuncture on me. I was skeptic at 1st as I never knew anyone who had it done before. He told me I would be relaxed and as soon as he did it, all my pain melted away. Again instant relief! I told him he is a miracle worker! I am entering my third week as a patient and my pain is down to a dull ache sporadically. The numbness is pretty much gone and I have no problems lifting weight. I am confidant that I will be back to normal in no time! Every appointment is a joy being greeted my Michelle at the front and even if I'm in any pain, Satishs' wonderful bedside manner brightens the day! Satish is the only person that can help me with my chronic pain. I have known Satish for over 10 years in which he has spent countless hours with me helping me with IMS and physiotherapy to treat my broken down body caused by 25 years of Chronic Lyme Disease. He never gave up on me and is very good at what he does. We were unaware of the fact that I actually was suffering with Lyme Disease until 2014, which made me a very complicated patient to treat. But he never gave up on me, and kept me up and walking and able to perform daily duties for many years. He is truly gifted in his field. With so many symptoms and body parts afflicted with this disease he was still able to somehow help me get through the darkest days. Once I finally got a diagnosis, he went even further and helped me to locate a doctor in the U.S. in order to get the help I so desperately needed. Then once I started treatment and spent almost 6 months in bed ill from the treatment, I am sure he is the only physiotherapist I know who calls regularly to check up and see how you are doing, He is so caring and compassionate. I recently moved to B.C., and also recently suffered a setback in my treatment because of some damage caused by the bacteria. I had so much faith in Satish that I booked a flight back to Alberta and spent a few days with him helping me to get back on track. The trip was definitely worth it. And I will not hesitate to do it again if need be while undergoing Lyme treatment. I felt so much better when I got back home. 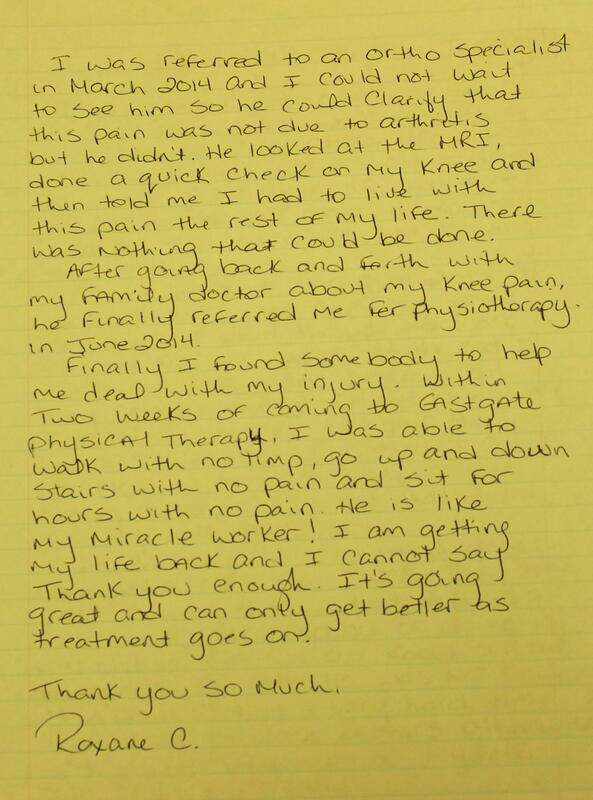 This man deserves a gold metal and definitely deserves the award of one of the top physiotherapists in Sherwood Park. I am proud of you Satish for winning this award. You definitely deserve it. I have been helped with physiotherapy at this clinic. Have really appreciated the treatement and teach to followup the treatments. I have some damage in lower back area and the treatments are making my muscles stronger and keeping my walking strong. I recommend Satish as a very knowledgeable physiotherapist. He is very caring and attentive to my needs. I continue to go to improve and strengthen my lower back and leg muscles.